The Cedar Street Bridge is the home of a mall of unique shops. This structure was the result of Scott Glickenhaus's dream to save the auto bridge and fashion it after the Ponte Vecchio in Florence, Italy. The charming boutique shopping mall known as Cedar Street Bridge is just the most recent in a series of historic crossing here. The city of Sandpoint and the Northern Pacific Railroad depot have been separated by the waters of Sand Creek since the station was constructed in 1884. The history of the bridges at this location are a view into the changing transportation needs of this northern Idaho community. The original bridge at Cedar Street was a low foot bridge consisting of stacked logs and decking. The first mention of a bridge was in the memoirs of Mrs. L. D. Farmin of the foot bridge that was destroyed after the winter of 1893 spring runoff. Their son took advantage of the situation by using a small rowboat as a water taxi. 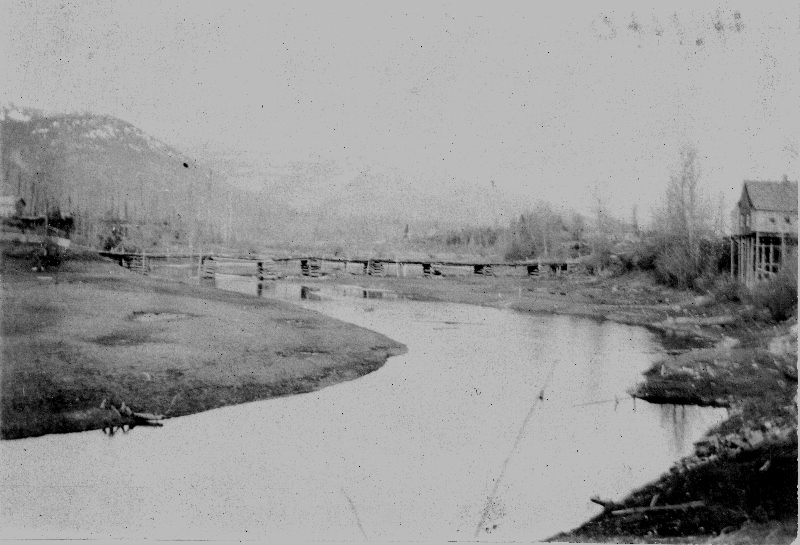 The Kootenai Hearld newspaper (September 22, 1894) reported Baldwin & Sadler, bridge contractors from Sandpoint, were to build a bridge across Sand Creek (Mill Creek) high enough to avoid flooding. Work began in November 1895. 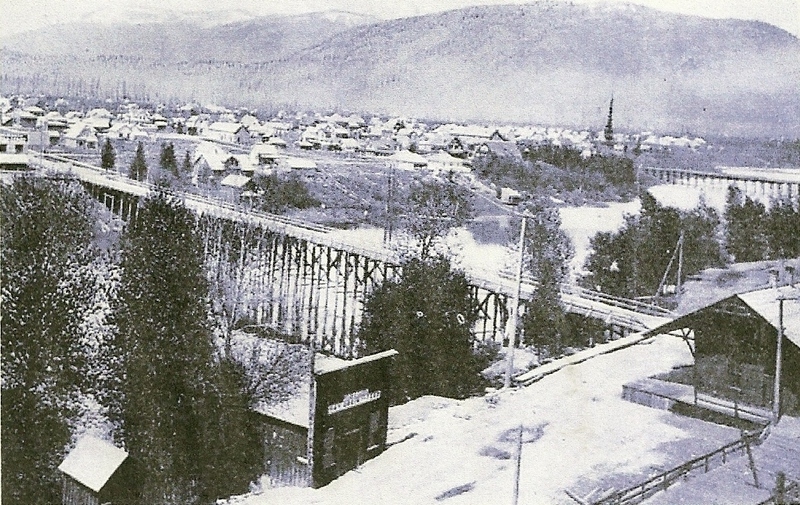 In 1903 Farmin offered to sell the bridge to the Village of Sandpoint trustees. They declined stating the price exceeded the value of the bridge. So he paid the $1,598 required by A. P. Gillies of Missoula, MT to build a new bridge which was completed in 1906. Prior to the completion of the bridge Farmin and the village trustees came to an agreement and an 80 foot piece of land spanning the creek was deeded to the city for $400. A new bridge was constructed in 1933 allowing automobiles to access the train depot. This upgraded structure was well used until 1971. At that time the Bridge Street Bridge located 800 feet to the south was modified to re-direct some of the heavy traffic from Cedar Street Bridge and allow easier access to the new city beach. A large part of the “heavy traffic” was teenagers “cruising the beach”, a popular pastime of driving around town and circling the beach using the bridge. In 1971 the Cedar Street Bridge was blocked to all traffic because the structure was not safe. By April 1980 the city flagged it as condemned. Scott Glickenhaus, a local businessman, leased the condemned bridge from city for $1 a year. He completely replaced the Cedar Street Bridge with his version of the “Ponte Vecchio” covered bridge in Italy. Glickenhaus used huge tamarack timbers in a post and beam fashion for the frame work. An outside walking path continued to connect the west and east banks of Sand Creek. The Cedar Street Mall Bridge spans 400 feet across Sand Creek from the intersection of First Avenue and Cedar Street to the base of the Burlington Northern Santa Fe railroad depot. Tourists gather to explore the unique shops featured in this mall. 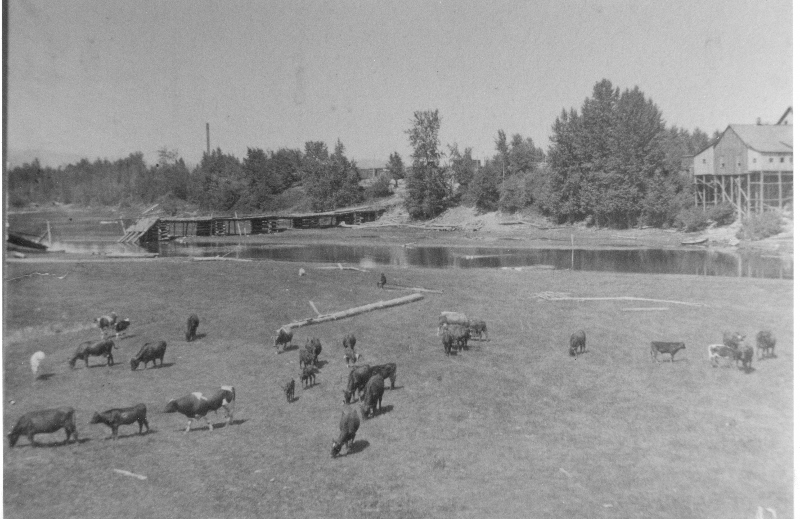 Cedar Street Bridge in 1890: Cattle grazing in the creek bed during low water in 1890. The early Cedar Street bridge spans Sand Creek in the distance and was funded by L. D. Farmin. Courtesy of the Bonner County Historical Museum. The first bridge at Cedar Street across Sand Creek. : Cedar Street Bridge funded by L. D. Farmin. The strip of land of the original townsite was so narrow the businesses had to be built on stilts on the banks of Sand Creek. This picture taken in 1890 shows few buildings on the west side of the creek. Courtesy of the Bonner County Historical Museum. 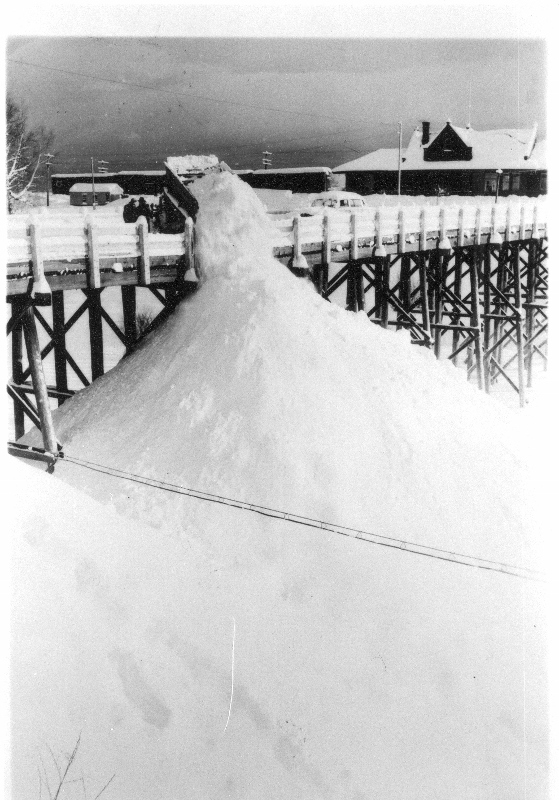 The Cedar Street Bridge in the winder of 1949.: Dumping snow off the Cedar Street bridge during the winter of 1949. The practice of dumping snow from the streets into Sand Creek occurred prior to learning how it impacted the environment. Photo by Jim Wolfe and courtesy of the Bonner County Historical Museum. The Cedar Street Bridge from the east side of Sand Creek in Old Sandpoint. : Sandpoint 1907 showing Cedar Street Bridge connecting the town and the new train depot. Sandpoint was beginning to expand toward the mountains. The bridge in the upper right was from the Mill Town section of Sandpoint to the Humbird Lumber Company Mill. Courtesy of the Bonner County Historical Museum. Cedar Street Bridge Public Market 2015: The front of the Cedar Street Bridge Mall from the newly built foot path along the west side of Sand Creek. After the Albeni Falls Dam and Cabinet Gorge Dam were built the water level raises during the summer and lowers during the winter. 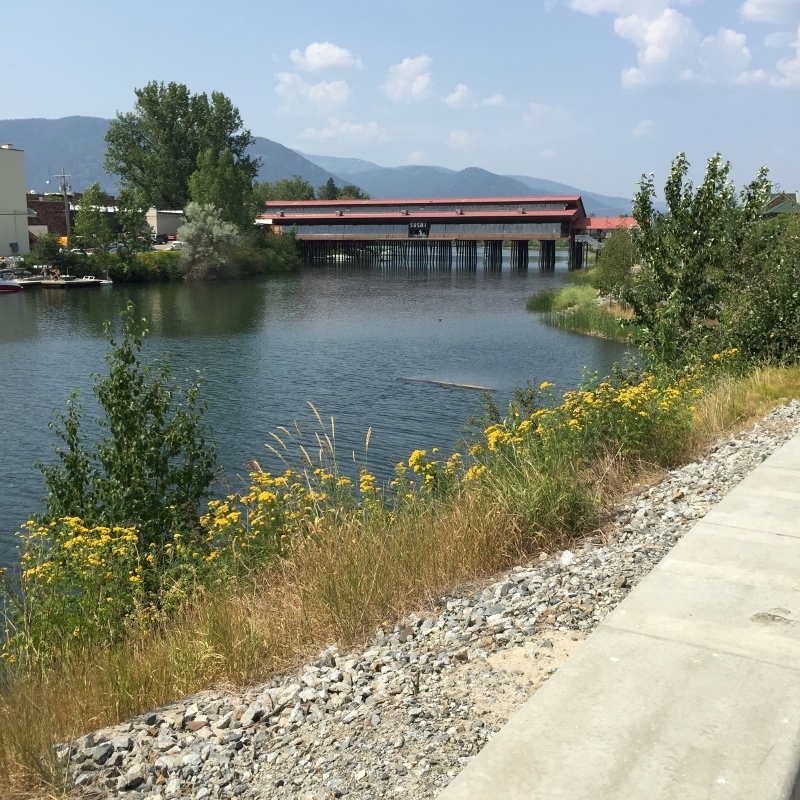 You can see the tip of the Sandpoint Train Depot on the right of the bridge. Picture courtesy of Mary Garrison. Mary Garrison, “The Cedar Street Bridges,” Spokane Historical, accessed April 20, 2019, https://spokanehistorical.org/items/show/573. Cedar Street Bridge Public Market – Sandpoint, Idaho Shopping and Dining, from the "Cedar Street Bridge: A Span across Sandpoint's History," available at http://www.cedarstreetbridge.com/cedar-street-bridge-history.html. Pietsch, Gary. "Bridges Over Sand Creek." Bonner County History Museum,” (2015) available at http://www.bonnercountyhistory.org.